Widespread references to baseball inning analogies underscore the pre-occupation these days among industry players with how much more time is on clock (ugh!) before CRE market fundamentals and sales prices begin to falter. Seven years into the market's expansion, an absence of clear directional signals only heightens the unease and perceived investment risk for lenders and buyers. Yet small balance market participants may draw some inferences about the future outlook from residential housing market trends. As we have cited in times past, small cap CRE prices tend to move more closely with residential housing prices than they do with values of institutional assets. Our newest study reinforces those relationships, and offers some insight into the durability of the small-cap market expansion. As shown in the nearby graph, the linkage between small cap CRE and residential housing prices (as indicated by the S&P Corelogic Case-Shiller National Index) has been modestly strong with a correlation coefficient averaging .51 over the past 10 years. The strength of the relationship was at its height during the previous peak era of 2007-2008, and a similar positive relationship has re-emerged over the last couple of years as the market has matured. You might note that any specific point in time on the graph shows the lagged effect of 36 previous months of correlations, so that, e.g., SCPI's lowest correlations with residential housing occurred during the three years climaxing in 2012 when both indices bottomed out after the Great Recession. This makes a lot of sense since we know from previous Boxwood research that small cap CRE prices lag residential prices on the way down but are more closely aligned on the way back up. 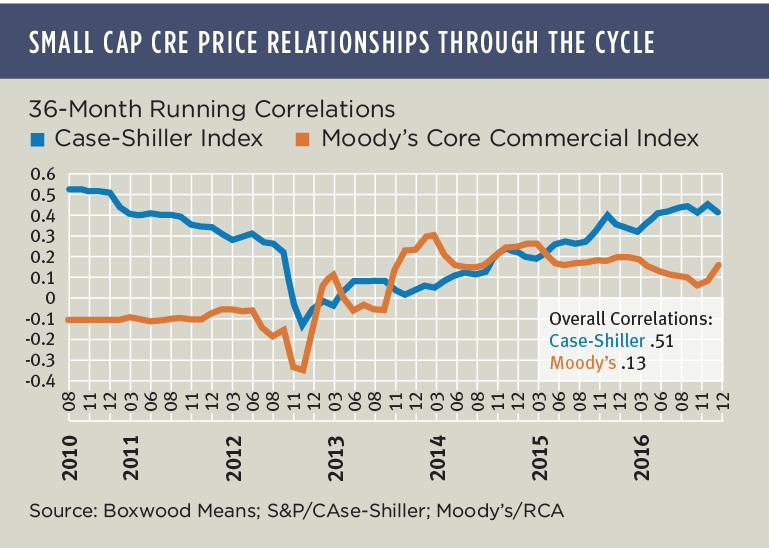 By contrast, SCPI's correlation with institutionally-oriented asset prices (as indicated by the Core Commercial sub-index component of Moody's/RCA CPPI that excludes multifamily) has been consistently weak, with an overall coefficient of just .13. Indeed, prices were negatively correlated during the downturn and only slightly positive during the initial years of recovery. Later, including nearly 30 consecutive months between 2013-2015 as institutional asset prices jumped by double-digit percentages, that relationship tapered even further since small cap CRE prices advanced at only a very modest pace. So, to the extent that past is prologue, the takeaway for small balance lenders and investors is to follow local residential housing market trends closely because as goes housing, so goes small cap CRE. The fact that the S&P Corelogic Case-Shiller National Index rose 5.8% in the 12 months ending in March - the highest pace in nearly three years - along with increasing home sales and housing starts in many areas of the country pose a strong, parallel argument for a sustained and robust small commercial property market.